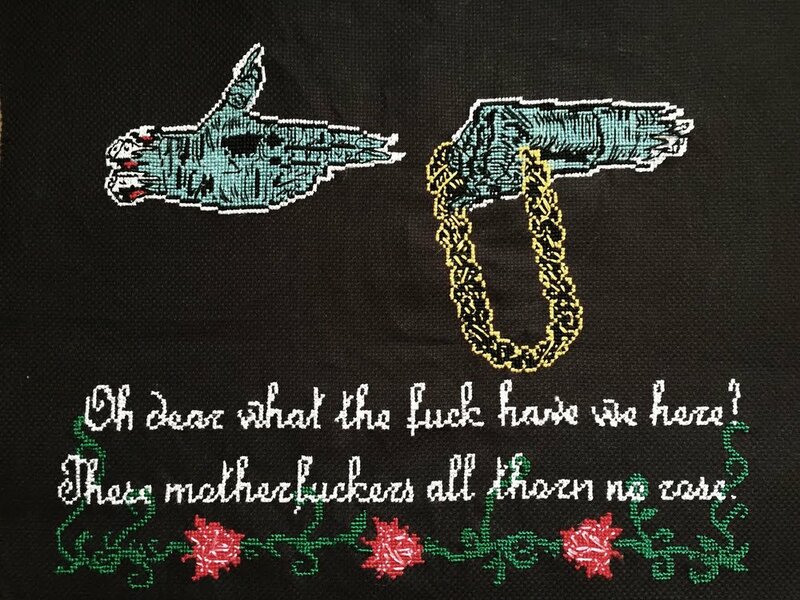 "The Chicago Cross Stitch Artist Who's Friends With All Your Favorite Rappers"
Emma Mckee isn’t your average cross stitcher. Born in Kansas City, she was first introduced to the medium through her mother, a British opera singer who frequently attempted to teach Emma how to stitch during her childhood. Yet she always refused to learn, finding the British craft too antiquated — that is, until she found a way to make cross stitching work for her. In 2014, Emma stitched her first piece: An adaptation of Will Prince’s artwork for Chance the Rapper’s song “Hey Ma.” She followed that with a piece for street artist JC Rivera, Chicago’s “Bear Champ.” Her portfolio expanded from there, as she firmly planted herself within Chicago’s rap community, as the scene’s preeminent — and only — hip-hop cross stitcher, earning the name Stitch Gawd. Since 2014, she’s created countless pieces for musicians and artists both in and outside Chicago. But she never sells her work, employing a barter-only system, solely making pieces for creatives whose work she truly appreciates. Now, she’s begun to call in some of those trades, in the form of song features and beats, and visual arts. What that will culminate in is the Stitch Tape, a dynamic musical project that speaks to Chicago’s — and current rap’s — endless artistic talent.